Simon Rosenberg is the most bullish of Democratic strategists. The former Clinton administration official and head of the young non-profit group NDN has been the chief proponent of the belief that Barack Obama's election produced the opportunity for a "30-to-40-year era of Democratic dominance." A specialist in the political habits of different demographic groups (specifically Hispanics), he insists that, absent a drastic makeover, the GOP risks cementing itself "as irrelevant to the 21st century." Sagging poll numbers and policy setbacks have done little to dissuade these rosy prognostications. There's only one thing that makes Rosenberg nervous: another Bush. "Jeb [Bush] is married to a Latina, is fluent in Spanish, speaks on Univision as a commentator, his Spanish is that good," Rosenberg said of the former Florida governor and brother to the 43rd president during a lunch at NDN headquarters last week. "And if you look at the electoral map in 2012, you have to assume that Obama is going to have a very hard time in holding North Carolina and Virginia. The industrial Midwest, where the auto decline has been huge, has weakened Obama's numbers... a great deal. So Ohio, Michigan, Indiana and Wisconsin become a bit more wobbly. So if you're Barack Obama, the firewall is the Latin belt from Florida to southwestern California. And there is only one Republican who can break through that firewall. And it is Jeb." Such a sentiment, Rosenberg admits, carries a slight hint of hysteria. After all, there is a good chunk of the country that recoils at the idea of another pol with the Bush surname. But that chunk has begun narrowing. And even within Democratic circles, there is an emerging belief that in a Republican Party filled with base-pleasing dramatizers or bland conservatives, Jeb stands out. "The vast majority of the voting public yearns for a non-Bush," said longtime Democratic strategist Donna Brazille. But, she added, "Jeb has the talent, the experience and the ability to rebuild the GOP's tent." "I believe Jeb Bush could run," said Stanley Greenberg, a longtime Democratic pollster. "He is more of a genuine conservative than Romney. Bush is a big hangover, but not impossible." The question, Greenberg asks, is "does his immigration position get him into primary trouble?" Talk of a prospective Jeb Bush presidential run in the 2012 election is, by definition, speculative. But Rosenberg's frankness in acknowledging his fears gets at a larger, more immediate political phenomenon. Roughly one-and-a-half years after George W. Bush left office with abysmal approval ratings and the likelihood of historical ignominy, the Bush brand is vying once more for political relevance. Within Republican circles, the fear that once accompanied any association with the 43rd president has diminished. There remain, of course, substantive critiques of Bush's presidency. But those are mainly offered as a method of distinguishing oneself as a fresh, fiscally sound breed of Republican. Behind the scenes, some of the major figures from the Bush years have assumed influential roles. Karl Rove, the strategist chiefly responsible for George W. Bush's rise to political prominence, has become the de facto Yoda of the Republican Party, dispensing wisdom in private and from his various public perches. Ed Gillespie, the former RNC chair and Bush hand, has assumed a more institutionally important position, launching a public opinion firm (Resurgent Republic) as well as a election-oriented organization (American Crossroads) that is promising to spend big on the 2010 elections. To be sure, many Bush-linked figures have become, essentially, apolitical in the post-administration era (think: former RNC chairman Ken Mehlman). But others have yet to kill the political bug, such as Sara Taylor, an ex-Rove aide who now plays an important role with likely 2012 candidate, Minnesota Gov. Tim Pawlenty. And then there is Jeb. The former governor, GOP officials say, has become increasingly engaged in charting the future of Republican politics. In addition to working closely with House leadership on various rebranding efforts, he helped craft the delicate strategy that the party took in the Florida Senate Republican primary. Understanding that the National Republican Senatorial Committee was essentially obligated to put its support behind his successor, Charlie Crist, he cautioned chairman John Cornyn (R-Tex) to anticipate Tea Party favorite Marco Rubio's rise. The committee was, subsequently, well-positioned to handle Crist's GOP defection. "I am running into him more around the country than before I would have expected, more [than] when he was governor," said Grover Norquist, head of the influential Americans for Tax Reform and a connected Republican tactician if there ever was one. "As I travel around, I hear Jeb Bush was here last week or is coming next month. And I didn't hear that when he was governor..."
What kind of impact the Bush reemergence will have on the broader landscape is a hotly debated question within both party circles. During the 2008 cycle, these officials were marginalized -- either burned out from the past eight years or too toxic for prospective candidates to touch (the McCain campaign, famously, had a fiery relationship with the former president and his team). Now back on, what one operative called "political terra firma," they have already positioned themselves as the axis around which the GOP's election strategies will turn. Both Rove and Gillespie have used their Rolodexes to recruit major donors and their reputations to pow-wow with some of the more high-profile candidates. Of course, there's some self-aggrandizement going on, several officials cautioned anonymously. Rove, in particular, is often described as more interested in advancing his own brand, often by overstating his influence. "Karl seems to be mostly in the Karl Rove business," said one GOP operative. "Selling books, going on TV, writing for the Wall Street Journal, speaking engagements. I don't know much advising he is doing." But that sentiment is not shared by everyone. Indeed, at a time when the campaign committees (mainly the RNC) have floundered, more top-flight Republicans are looking at the operatives who led the Bush years as the closest they can get to a sure thing. "I think that those two particularly [Rove and Gillespie] bring a credibility," says Norquist. "If you want to write a really big check, you trust Ed Gillespie and Rove will spend $1 million wisely... Both of them you can look at through the prism of the last six election cycles. They've won some and lost some but they are always shooting in the right direction." Whether that direction ends up being right for the GOP in 2010 remains to be seen. For Democrats, Rove's involvement has been cheered -- in as much as it's created the ideal boogeyman to get the 2010 blood flowing. "He is larger than life all across the spectrum," explained Tracy Sefl, a Democratic strategist who has worked on campaigns at all levels of governance. "His contradiction is being well-known for the colossal failures attributed to his watch and also being well-known for his intellectual, strategic abilities." But the major question is whether or not the old Bush guard is properly suited for the modern GOP. Rove, to this point, has had two high-profile endorsement busts: Sen. Bob Bennett in the Utah Republican primary, and Sen. Kay Bailey Hutchinson in the Texas gubernatorial primary. In each instance, he found himself on the wrong side of the Tea Party movement. Whether those are simply glitches in a broader effort to get Republicans elected or indicative of the grassroots and the Bush clan not operating off the same playbook is a major question going forward. And it's one that Jeb Bush -- as he ponders a potential 2012 bid -- will have to consider as well. "I think that Bush-ism is still alive," said John Feehery, a longtime GOP consultant. "There is, however, an anti-Bushism in the party associated with the Rand Paul crowd. They don't like neocons and government. And Sarah Palin could be seen as part of that group... What people like about Jeb Bush is that he is smart and conservative and well-liked by the base... If there is going to be a Bush revival, Jeb is going to be the leader of that revival. But he has to contend with that [anti-Bushism]." And I just saw on Drudge that Bush is coming out with a book thats going to come out about election time. Is their going to be a chapter on Jeff Gannon? Or maybe this is an attempt to get Obama re-elected in 2012 - throw a Walter Mondale-like guy in there noone likes to begin with. Alot like 2004 when it was obvious Bush II was beatable, they threw in his Skull and Bones buddy John Kerry that blindly followed every neocon issue when he was in the Senate for those 4 years with Bush. That way, because he too supported the Iraq war, all eyes would be focused on him over why he supported this draconian agenda, rather than on Bush and all his blunders for 4 years. Aren't all those guys out running around nekkid in the woods worshiping a concrete owl this weekend? There is allways a method to their sociopathic freak shows. RP must have the Party machine types running scared. They know they can's depend on the bimbo (Romney) or the bimbette (Palin). So, they run the tried and true back up the flagpole, a Bush. It was a Bush that got Soetoro elected, however, lest we forget. Eight years was too much and too far for Poppy, and eight years of sonny boy was too much for all of us. Huffington Post reporter Sam Stein went on MSNBC this morning to discuss his recent article, The Bush Revival: How Jeb, Rove, Gillespie Are Leading The GOP Again. 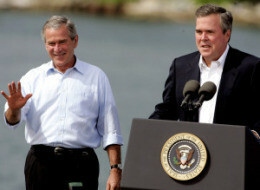 Much of the speculation about the 2012 presidential election has been focused on former Florida Governor, and brother of the last president, Jeb Bush. But Stein points out that "the Bush revival" is bigger than just Jeb. Figures like Liz Cheney, Karl Rove, and former RNC Chair Ed Gillespie are "becoming more assertive in the current landscape," according to Stein. "They're crafting strategy for retaking the House and the Senate in 2010, and they have the type of credentials that a lot of Republican candidates are leaning on," Stein said. "The toxicity that used to be accompanied by associating with Bush is really very much gone in some respects." We will see - who knows? Maybe this is a big attempt by the elite to keep Obama in office, especially because the Bushes aren't exactly popular now? Alot like how the elite had Bush's Skull and Bones buddy Kerry to run against him in 2004 to seal up his re-election bid? Ditto the elite throwing in Bob Dull in 1996 so Clinton likewise?